Well that's me now on my way to Who Do You Think You Are? Live at Olympia in London (Friday to Sunday, see www.whodoyouthinkyouarelive.co.uk). I'll be helping Robert Blatchford on stall 811, helping to sell the Family and Local History Handbook as well as the new CD omnibus edition of the first ten editions, with some very special offers. Robert's website at www.genealogical.co.uk has all the details. If you are coming along, I'm happy to offer some free advice on any queries you might have also. If you are going, have a great time - and I'll maybe see you there! The ScotlandsPeople Centre has been fully open for several weeks now. The new research system not only allows access to the BMDs, OPRs and Scottish census records, but also wills and testaments and heraldry records. What you may not be aware of, however, is the fact that whilst seated at your terminal, you can also access a vast range of exterior based websites, including Ancestry.co.uk, FindmyPast, Family Search, SCRAN, the NAS catalogue, EDINA, and many, many others. For websites that require a subscription - such as Ancestry and FindmyPast - you will need to have your own subscription paid for, and to log in with your own personal username and password. However, the flexibility for family history research in the centre with these sites available at your fingertips is dramatically enhanced compared to the previous set up with the old DIGROS system, which will soon be completely phased out from the centre (it is temporarily still in use in the Dundas Room). Where before you could find a soldier's death cert, for example, you can now find the same record, cross refer it to the Soldiers Died in the Great War database on FindmyPast, check for a medal index card and service record at Ancestry, and see if a will exists for him in the Soldier's Wills collection as listed on the NAS catalogue - all within a couple of minutes. Next time you are in, it may well be worth spending another ten minutes to explore the Useful Websites link on the left hand side of the screen - you may well be in for several major surprises! A quick plug to announce that the newly established Scottish Military Research Group will be making its first appearance at the SAFHS conference at King's College Conference Centre, Aberdeen, on Saturday April 25th 2009. 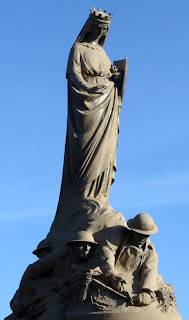 Whilst a new group, it actually encompasses two long standing online research projects, the Scottish War Memorial Project at http://www.scottishwarmemorials.co.uk/ and the Scottish War Graves Project at http://www.scottishwargraves.co.uk/, run by some very dedicated volunteers across the country and beyond. If you can help contribute to the work, they would love to hear from ye! The group has some exciting plans, including some product releases in the near future which will be of great assistance to those with ancestral connections to the subject matter. The group's website is available at www.spanglefish.com/ScottishMilitaryResearchGroup. For more on the SAFHS conference, please visit www.safhs.org.uk/SAFHS_Conference.asp. The Isle of Harris has just voted to turn their island into Scotland's third national park, following on from Loch Lomond and the Trossachs, and the Cairngorms. The full story is at http://news.bbc.co.uk/1/hi/scotland/highlands_and_islands/7899003.stm. If you haven't been to Harris, you've somewhere beautiful still to visit. I fired a rocket there once for a TV programme, but it wasn't in anger...! (And if you're learning Gaelic, it's easier to understand them there than in Lewis! ha!). Good luck to the Hearrachs! Just read an interesting tale at Kimberley's Genealogy Blog. An attempt to use genealogy to help identify a sufferer of amnesia is currently underway in Richmond Hill, Georgia, in the US, where a man calling himself Benjamin Kyle was found badly beaten up. A Y-DNA test has been taken and genealogists are trying to find a match for a possible relative. Is this the first instalment of an interesting new genealogical detective series - CSI: Utah..?!!! Fascinating stuff! More at http://genealogy.about.com/b/2009/02/17/using-genealogy-to-identify-an-amnesia-victim.htm , including links to the DNA project involved. 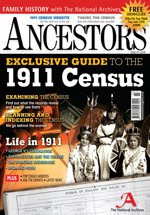 The latest issue of Ancestors magazine is out and is a special dedicated to the 1911 English and Welsh census. You might think from a Scottish point of view that this is not relevant, but never mind the fact that many of our Scottish ancesors were also living in those countries, it was also Dundee based Brightsolid which digitised the returns at the National Archives at Kew! Penny Law has a fascinating account of exactly how they went about it - personally speaking, I find these documentary style articles as interesting as the findings we make within the hobby itself, and in this case, the process was a great deal more involved than simply shoving a book under a scanner. Other articles include user guides to using the census, an account of how the census was actually carried out, useful supplementary sources for researching relatives around in 1911, First World War service records, and more. The Electric Scotland website, which has for many years been placing interesting content online like the plague is in town (! ), has another interesting publication currently being transcribed and uploaded to the site - The Social and Economic Condition of the Highlands of Scotland Since 1800, by A. J. Beaton (1906). It's one man's vision of what needed to be done over a hundred years ago to improve the Highlands, and it is available at www.electricscotland.com/history/socialeconomic/index.htm. Interesting review of "Unions and Unionism - Political Thought in Scotland, 1500–2000" by the University of Glasgow's Colin Kidd (Cambridge University Press) at www.workersliberty.org/story/2009/02/19/unionism-–-made-scotland. The book apparently argues that Scottish nationalism was always the ultimate form of unionism. Only from academia...! If the book is as interesting as the review, though, it could be a good read. The preface, with additional info, is online at www.cambridge.org/uk/catalogue/catalogue.asp?isbn=9780521706803&ss=fro. We are delighted to announce our Y-33 test has been reduced from $149 to only $79. Not only have we improved the price, we have been working hard at adding new features and improving the customer experience. Anyone with DNA results can join the database for free and download their free report, find genetic cousins and learn about their ancient ancestry. Ancestry family tree integration - a new feature that allows a DNA participant to attach their DNA to the appropriate Paternal and Maternal lineages. Since DNA remains relatively unchanged when passed from generation to generation, when attached to a member’s tree, the DNA will be propagated up the paternal line (Y) and maternal line (mtDNA). New User Interface - helps people understand their results and what they can do with them. Fun facts - ever wonder what other R1b people liked to eat or watch on TV? Thanks to some multiple-choice questions displayed online for all DNA test users to answer, users can get a more in-depth knowledge of how they match with others in their haplogroup. An article on how Ancestry's DNA test can assist with your family history research is available on the Scotland's Greatest Story website at www.scotlandsgreateststory.bravehost.com/DNA.html . The service itself is accessible at www.ancestryshop.co.uk/DNA.php. The Edinburgh based Scottish Genealogy Society has been going since 1953, and has an impressive website at www.scotsgenealogy.com, which hosts a useful range of research guides, a shop, a family history index, and links to many topics relevant to Scottish genealogical research. However, you may not be aware that the site also has its very own discussion forum at www.yabbers.com/phpbb/scotsgen.html, open to members and non-members alike. Please be aware that from spring 2009 we will be making the following changes to our services - full details will be provided nearer the time. You will need to specify your requirements precisely, including the number of pages, for us to provide you with an estimate of the cost of record copying. We will no longer be able to search within documents to identify the items to be copied for estimation purposes. If a search is required to identify the items to be copied, you will now be offered the options of engaging an independent researcher or using our paid search service. We have taken this decision because, while we have been providing an increasing number of estimates, the number of actual copy orders from these estimates is declining. As a result, the service no longer covers its costs. The bottom line appears to be that if you have located an item via the TNA catalogue, where before you could ask for an estimate on how much it would cost to copy particular documents, you will now have to hire somebody either at TNA or privately to look at the documents prior to ordering them, in order to work out how many pages need copying. Further announcements on this are expected soon. Having relied on the service myself in the past, I personally think this is an unfortunate development from an institution that has done so much in recent years to try to make its material so accessible to the general public. Two new monumental inscriptions books have been published by the Aberdeen and North-East Scotland Family History Society. The first, covering the kirkyard at Doune (Macduff) contains inscripitons from over 900 stones, and includes a handy fold out map identifying the location of each lair. The second, on the kirkyards of Kinneff and Catterline, contains inscriptions from three churches - Kinneff, Catterline St. Catherine, and Catterline St. Philip's (Episcopal). Both cost just £2.25, plus postage - 66p for second class UK, £2.55 for airmail to North America, £2.55 airmail to Australia, £1.55 to Europe and £1.50 surface mail to all other countries. For more information, visit www.anesfhs.org.uk. A fire occurred in the early hours of Monday at the 13th century Kelburn Castle, between Largs and Fairlie, home to Lord Glasgow, 10th Earl of Glasgow. Both he and his son evacuated safely from the building. The fire has damaged the roof and an upper floor room of the building, which is believed to be the longest building in continuous use in Scotland by the same family, for some 800 years.. The full story is at http://news.bbc.co.uk/1/hi/scotland/glasgow_and_west/7892247.stm. Kelburn Castle is about five minutes from my house, so I'll provide an update in due course. The BBC is reporting a funding crisis at the Scottish Mining Museum, located at Lady Victoria Colliery in Newtongrange. Historic Scotland and Midlothian Council have both withdrawn funding, essentially cutting the mueum's funding by a third. Midlothian Council argues that as a national museum, it should receive national funding. The full story is at http://news.bbc.co.uk/1/hi/scotland/edinburgh_and_east/7892429.stm , with a blog post on the subject from reporter Pauline McLean also located at www.bbc.co.uk/blogs/thereporters/paulinemclean/2009/02/heavyduty_museum_issues.html. The main museum website can also be viewed at www.scottishminingmuseum.com. The Book of Scottish Connections is a new public record held at the General Register Office for Scotland which allows people all over the world with a Scottish connection to apply for a birth, death, marriage or civil partnership abroad to be recorded by the Registrar General in Edinburgh. To qualify for registration, the original event has to have already been previously registered with the civil registration authorities of the applicant's country. A commemorative certificate of the event, with a description of the Scottish connection, will then be available from the GROS, which can be preserved as part of the family history record. Tartans and kilts are fine, but what better and more tangible way is there to show that your family's Scottish connection has been forever remembered in your ancestral country, and that you yourself have been officially recognised by your Caledonian cousins as a member of the greatest diaspora in the world - one of Jock Tamson's Bairns...! For more info, see www.gro-scotland.gov.uk/regscot/book-of-scottish-connections.html. Nigel and the team at The Genealogist.co.uk have been busy placing new records online at their site, which includes some Scottish holdings. In the new Schools, College and University Registers section you can now access the Aberdeen University Roll of Graduates from 1901 - 1925, whilst Glasgow University's Matriculation Albums from 1728 - 1858 are also available. In the Directories section, the 1923 - 24 Aberdeen Post Office Directory is available and the Official Guide to Edinburgh, circa 1930. In addition, the Roll of Edinburgh Burgesses and Guild Brethren is also available in the same section, covering the years 1406 - 1700. To see the records, available for a small premium, visit www.thegenealogist.co.uk. The Irish Government has funded a new online database of interest to those with architects in their ancestry. The Dictionary of Irish Architects 1720-1940 at www.dia.ie can be searched by the name of the architect in question, or by the work he created. As well as Irish architects it also lists those who were from overseas who produced buildings in Ireland, and so, for example, we find that Scottish born William Henry Playfair (1790-1857) is listed, having designed Drumbnanagher in County Armagh in 1829 and Brownlow House in Lurgan between 1833 and 1835. Don't forget that Scottish architects can also be researched online, at www.scottisharchitects.org.uk, which covers 1840-1980. The latest newsletter from Electric Scotland has announced a new book being transcribed on the site, Folklore of Scottish Lochs and Springs, by James M. Mackinlay, and first published in 1893. See www.electricscotland.com/history/water/index.htm. The project is a collaboration with Ancestry.ca, and is great news for those whose Scottish ancestors migrated to Canada. Eight fire engines were called out to the College of Arms in London this morning, to put out a major fire in the premises. The fire was brought under control by forty firemen by early afternoon. Nobody was injured, and it is believed that no documents have been destroyed. The College of Arms holds many important heraldic records for England, Wales, Northern Ireland and the Commonwealth. For more on the story, visit http://news.bbc.co.uk/1/hi/england/london/7872224.stm and http://www.timesonline.co.uk/tol/news/uk/article5669426.ece . As part of the recent Act passed to create a Scottish Register of Tartans, one stipulation was to make the information in the register available to the general public. As of today this requirement has been fulfilled with the online launch of the Scottish Register of Tartans website at www.tartanregister.gov.uk. The site is fully searchable, and holds thousands of designs, including many held by the Scottish Tartans Authority and the Scottish Tartans World Register. The site also allows you to register a new design and to obtain detailed technical information on the many designs already held (colours, thread counts etc). If you have a military ancestor, a new website might be able to help you locate a medal to which he was entitled. The site is located at www.findamedal.com. A major new resource from Scotland's leading archives and libraries has been launched in the form of ScotlandsImages.com. SCOTLANDSIMAGES.COM is a picture library taken from Scotland's national collections. The National Archives of Scotland, in partnership with The National Library of Scotland, National Museums Scotland, The National Trust for Scotland and The Royal Commission on the Ancient and Historical Monuments of Scotland, have developed this image library to make available for licensed reuse selected images from the extensive, and often unique, holdings of Scotland's national collections. It is possible to search for images and save them to a personal lightbox on the site, and also to purchase prints. The site is embryonic, and represents a small fraction of the collections of the institutions involved, but new content will be added constantly. For more information, visit www.scotlandsimages.com . Issue 3 of the new Scottish family history magazine Discover my Past Scotland is now available online. Downloadable in PDF format, or readable online, the magazine contains a wealth of articles and information for thse with Scottish heritage. In this issue, FindmyPast's Debra Chatfield discusses the outbound passenger lists available from the retailer (www.findmypast.com), Anthony Adolph discusses names, John Hannavy looks at Edwardian postcards, Ruth Symes examines 19th Century birthday books as a genealogical resource, Mary Richmond looks at family history resources in the Scottish Borders, and Rachel Bellerby traces ancestors on the Isle of Skye. Regular features include events in your area over the next month and the bygone days photo feature, whilst yours truly provides a round up of the latest Scottish family history news and products for your family history library. Never mind Discover my Past - Discover Your Past! Online at www.discovermypast.co.uk for a genealogically friendly £2.50. Such good value, it would make a grown man weep in the street...! The Gathering 2009 is aiming to help plant 10,000 trees to commemorate Scotland’s greatest ever international gathering of the clans. The Teaghlach Wood ('teaghlach' is Gaelic for 'family') is situated near the village of Comrie, in Perthshire, on the banks of the River Earn. The Wood aims to play its part in restoring Scotland’s landscape back to its traditional woodland state. All of the trees planted will be traditional woodland varieties such as oak, birch, ash, beech and rowan. Buying a tree for the wood will not only bring traditional broadleaf species back to the heart of Scotland, but also regenerate wildlife habitats and combat climate change. On Wednesday, February 18th, 2009, at 5.30pm for 6.00pm start, Lecture Room 1, McCance Building, 16 Richmond Street, University of Strathclyde, Glasgow. Supporters in Heraldry by David Sellar, FSA Scot, FR Hist S, Lord Lyon, King of Arms. Who Do You Think You Are? returned tonight to BBC1 in Britain at 9.00pm. It clashed with '24' on Sky1, and so I didn't think I would get a chance to view this until tomorrow, but fortunately I was able to watch it on BBC1 Northern Ireland, which is showing the series at 10.35pm - top tip if there is something else on you may wish to see! The show is also on BBC2 Tuesdays at 7.00pm, and repeated on the BBC iPlayer at www.bbc.co.uk/iplayer. A good strong opener - if anyone asks why you obsess so much about pulling your family history together, ask them if they ever saw the WDYTYA with Rory Bremner, and if they saw how much effort Rory's mum had put into preserving their history before her death - and how much it meant to him. UPDATE: The programme came second in the viewing for that slot, at 6.3 million viewers, or 23.1% share. On ITV, this was beaten by "Whitechapel", with 8.1 million viewers, or 29.7% of the share. An interesting series is currently being transmitted on BBC Alba entitled Suil Air (An Eye On...). It is an archive based programme with each episode providing a Gaelic perspective on the news events of Britain a year at a time. I've just watched 'Suil Air 1985' on the BBC iPlayer which had a detailed account of the visit to Eriskay by the Prince and Princess of Wales after their marriage, the Gaelic news series 'Prosbaig' airing at the time and its coverage of the Tottenham riots, the miners' strike, and more. It's essentially a sort of Scottish Gaelic version of 'Scotland on Film', covering recent historic events alongside new interviews with many who were there at the time. The series can be watched, along with additional Gaelic programmes, at www.bbc.co.uk/iplayer. The content is subtitled in English throughout. A feature in today's Scotland on Sunday discusses the current popularity of genealogy in Scotland, and includes an interview with deputy registrar general Paul Parr of the GROS in Edinburgh. The article confirms that representatives from both the Mitchell Library and the Burns Centre in Kilmarnock have recently paid a visit to the new family history centre in Dundee to see how they have set themselves up. The full piece can be read at http://scotlandonsunday.scotsman.com/scotland/Family-tree-craze-spreads-its.4934364.jp.